This tunnel is about 4 inches round and Measures 8 inches long. Specifically sized for small parrots such as conures, meyers, senegals, and caiques. Lots of jingly plastic toys attached to interest your parrot. Two Large Nickel plated bells attached to the bottom. We use leather pcs. on the inside which birds really seem to love to chew. Safe polished and unpolished Stainless Steel or nickel plated hardware. All wood coloring is food grade. This Tunnel can be hung from the Top or the Side of the cage, however, the bells and plastic chain look best when it is hung from the top of the cage. This tunnel has lots of leather and jingly bits and bobs for your bird to climb on and play in. Safe Stainless Steel hardware. All wood coloring is food grade. This tunnel has lots of wood, leather, and bagel pieces hanging on it with 100% cotton rope. This Tunnel can be hung from the Top or the Side of the cage. 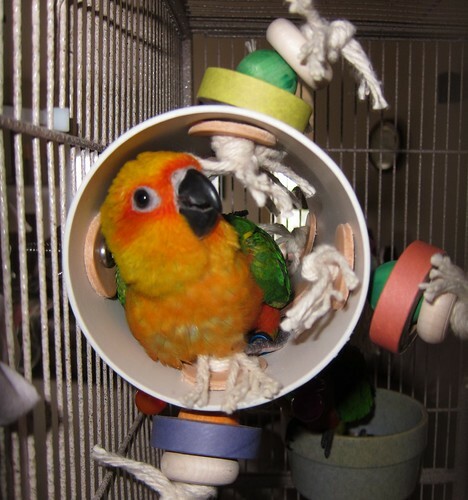 This tunnel uses leather rope to attach some fun toys for your bird to climb on and play with. This is just the bare Tunnel so you can decorate as you wish. Our babies and some of our retired or resting breeding pairs love a little space to snuggle up into for naps, bedtime, or just playtime. We have designed this play tunnel out of light weight drainage PVC. If you have purchased a baby from us, your baby has had a tunnel in his weaning cage. Right around the time the babies start to fly they discover the tunnels and spend alot of time playing in and around the tunnel. At night time it always surprises me how many babies can fit in this tunnel!! Most pet owners will not have more than 2 birds in a cage and this tunnel is the perfect size for two friends to snuggle up in. I suggest you hang the tunnel so that when your bird gets in the tunnel they can look out the front of the cage. They seem to be more comfortable with the tunnel hung in this way. For Safety reasons, I also suggest you do not hang the tunnel too close to the edge of your cage. Make sure your bird has plenty of room to move around all sides of the tunnel. It may take a couple days before your baby feels comfortable going in the tunnel. Give your bird a few days to get comfortable with the tunnel and you will see that they will go in the tunnel for both play and sleep. I also want to point out that there are two ways to hang the tunnel. You can hang the tunnel from the top of the cage, or from the side. I hang the tunnel in both ways in my weaning cages. The birds don't seem to mind which way the tunnel is hung. Just keep in mind if your cage has a play top and you plan to use the removable mess catcher grate under the play top, you will not be able to hang the tunnel from the top. At this time, I am making the jingle tunnel to be a top mount only.